Statistical software for biomedical research, also including ROC curve analysis, method comparison and quality control tools. Certified for Windows Vista. Junk-Out is an add-in for Microsoft Outlook that uses statistical (Bayesian) techniques to filter out junk e-mail (i.e. SPAM) from incoming messages. Statistical software for students and researchers. Designed as an easy to use tool for basic data exploration. Conduct statistical analyses and prepare summary reports. Special student prices. Free academic site licenses for school labs. 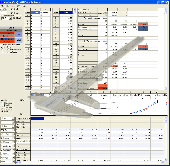 StatPlus 2008 is a powerful and flexible software solution that processes data to perform statistical analysis. No need to carry a mainframe to perform a complex analysis when you visit a remote lab. Get the full power of a precise data analysis tool always with you. Perform a statistical analysis on-the-fly without carrying a powerful, bulky computer. BioStat - user-friendly biology and medicine oriented statistical software.With BioStat 2009, one gets a robust suite of statistics tools and graphical analysis methods that are easily accessed though a simple interface. Promo price. Holmes is an automated debugging and failure-analysis tool that uses statistical analysis of code-coverage data to identify the most likely cause of test failures. SuperGIS Spatial Statistical Analyst is a set of application software integrating geostatistical methods and GIS functions. LeoAnalyst is an application for most common statistical analysis of data. LeoAnalyst is an application for most common Statistical analysis of data with intuitive friendly user interface. Distribution, approximation, signal revealing, 3D presentation function of two arguments, near neighbor method. Statistical analysis and report-ready chart. The perfect add-on for any spreadsheet.Â Clarity provides 14 powerful but easy to use analytical tools for anyone using a spreadsheet. Simply copy the data and click â€œCapture Dataâ€� in Clarity to begin your analysis. ClickWork is a no-nonsense, very-easy-to-use Time Tracker. Multi-user. Supports usergroups. Reporting on various levels. Statistical reports. Graphs. Features for manager. Fully configurable. Full featured trial version. Powerful licensing scheme.